The story has started long time ago, when a friend of mine had shown me a photo with four pieces of one meter long pike stuffed into the snow by his side. I was incredibly impressed! 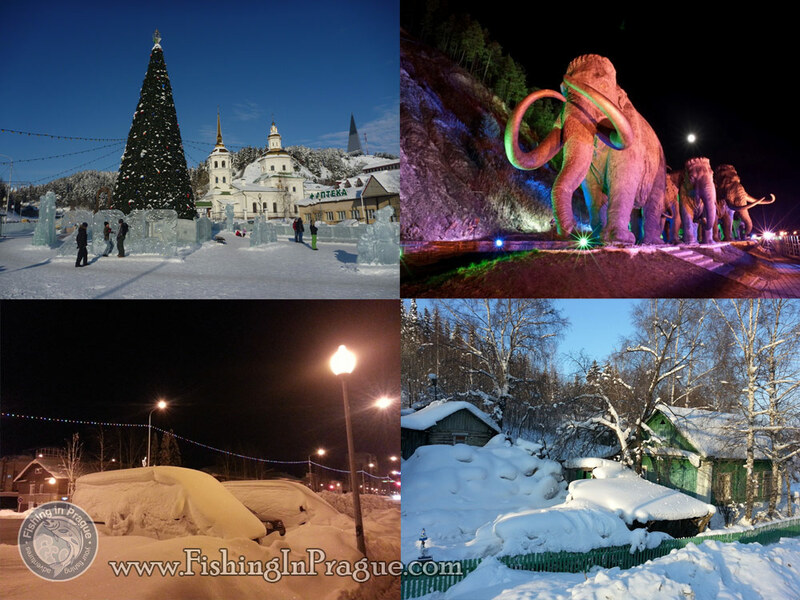 A few years later, on the end of November 2012, enjoying our lunch in the convenient restaurant close to the famous Old Town square in Prague we discussed with the famous czech fisherman and traveler Jakub Vagner about pike fishing. We was waiting for my friend Sergey, which has grown up in Siberia and knew a lot about siberian fish monsters. After that meeting we have made a decision to make a movie in Russia. However no one from us supposed it will be so tough…. A few days later I was back at the airport, waiting for arrival of the aircraft with Jakub, two cameramen and a sound engineer. The flight had an 8 hours delay in Yekaterinburg, so I spent the spare time in local tackle shop in order to acquire a frost resistance shoes, mittens, live worms and various fishing gear. I must say, that the main aim of our expedition was except pike fishing primarily finding indigenous peoples of the North (Khanty, Mansi, Nenets and Komi) and creating a document about their live style for Czech TV and Discovery channel. 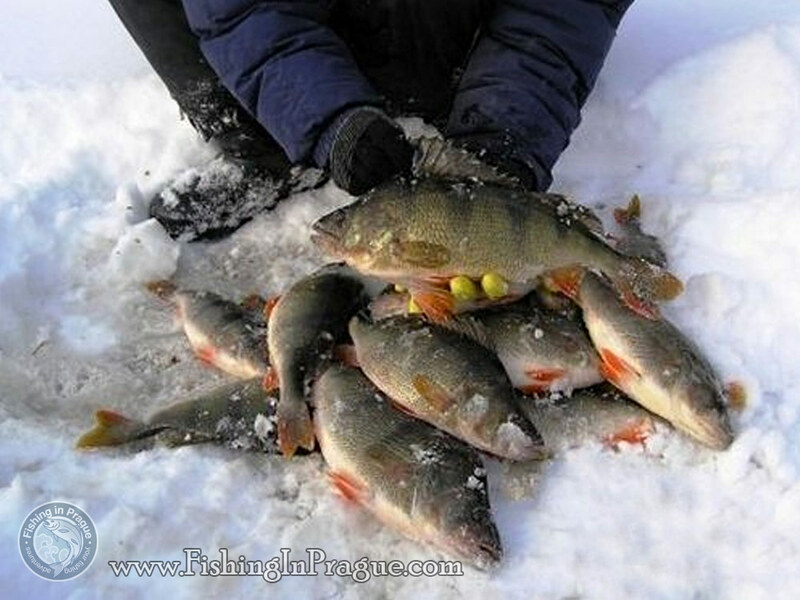 Immediately after arrival we loaded the volume luggage into the “loaf” – local name of UAZ minivan, and launched by “zimnik” to the fishing lodge Tuos, situated on a beautiful lake Imituy, famed for its abundance of large perch. Zimnik is a particulat road, which is opened actually after hard frosts of November through the swamps and forests, and “survives” until the end of March, when melting down. During the summer it’s almost impossible to reach these places, unless by helicopter or by water road. Despite the late evening was only 20 degrees under zero without any wind, very comfortable weather. By the way, the frost in the North is perceived more easily than in the Czech Republic due to the low air humidity. On Imituy we had just only one full day for filming. 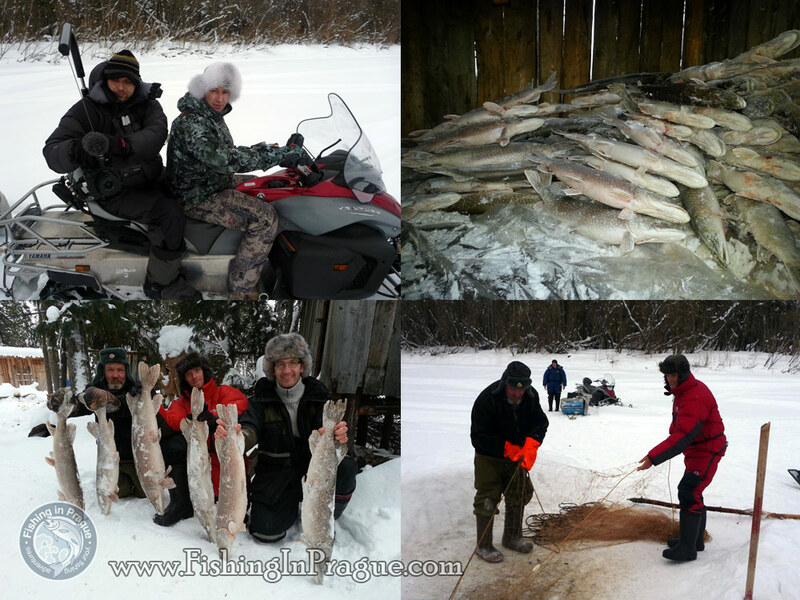 However, the owner of the fishing lodge Ramil has prepared everything in the best way, including all-terrain vehicle Trekol, which we used for moving across the ice, and even invited the famous perch specialist from Kurgan, who brought the “secret weapon” on perch – mormysh and pre-feeded some “hot” spots. Independently we almost failed to fish on that day, because we were constantly running around vehicle, anglers and our own tackle with cameras. During an hour of fishing, which I managed to carve out, I caught a dozen perches up to a kilogram – that was a very nice result! 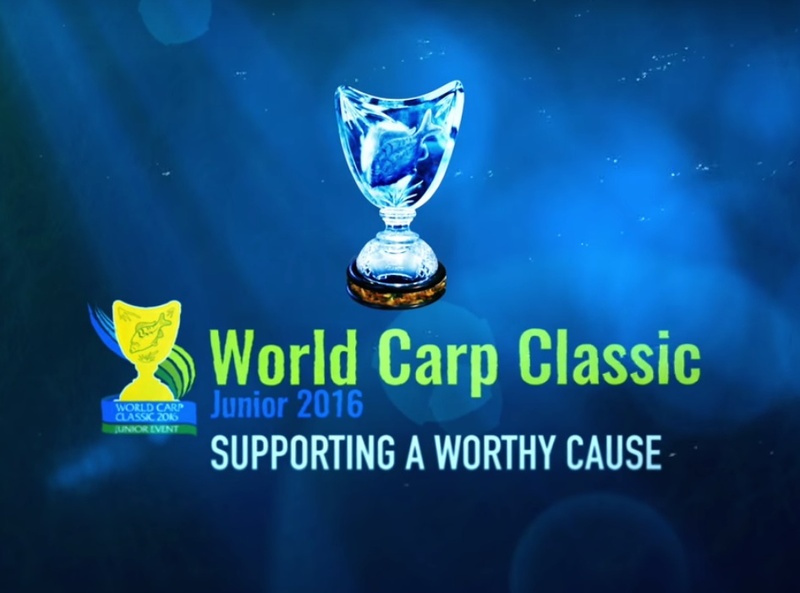 The most successful method for fishing was “marmyshka” with brass covering and tied red nymph above. Both hooks was planted by the mormysh; after each perch I throw a pinch of livе mormysh into the hole. During the day we have seen only one pike bite on on the live bait, but the fish had broken the montage in snags. The next morning we came back to Khanty-Mansiysk, where we were waiting by the government Volkswagen for transfer to Berezovsky district. 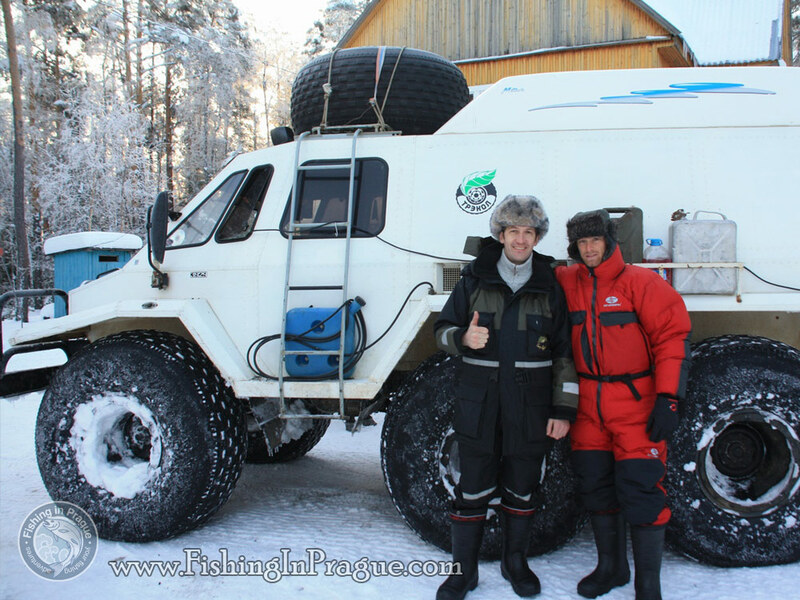 After 8 hours we finally arrived to the fishing lodge Bedkash,situated on the River North Sos’va, where we were greeted with a big smile like old friends by the owner Sergey Samohvalov and his right hand on the base Prokopytch. We were really surprised how these local people keep fish durign the winter. Fish, mostly pike was piled up like a firewood in “labaz” (so-called “hut on chicken legs” where the food is usually hidden from the wild beasts)! The next day, after putting live baits into the water, we went for filming commercial fishing by nets. After return back to “zherlitsy” (special fishing device for live bait) at dusk we saw the three strikes. Something big couldn’t climb out through the hole! I had to call up by radio Sergey from the lodge, which brought on a snowmobile ice chisel for crashing the ice and pulling out a monster. Believe me, making a hole in the meter wide ice with a big pike on the other end of fishing line is more than exciting! 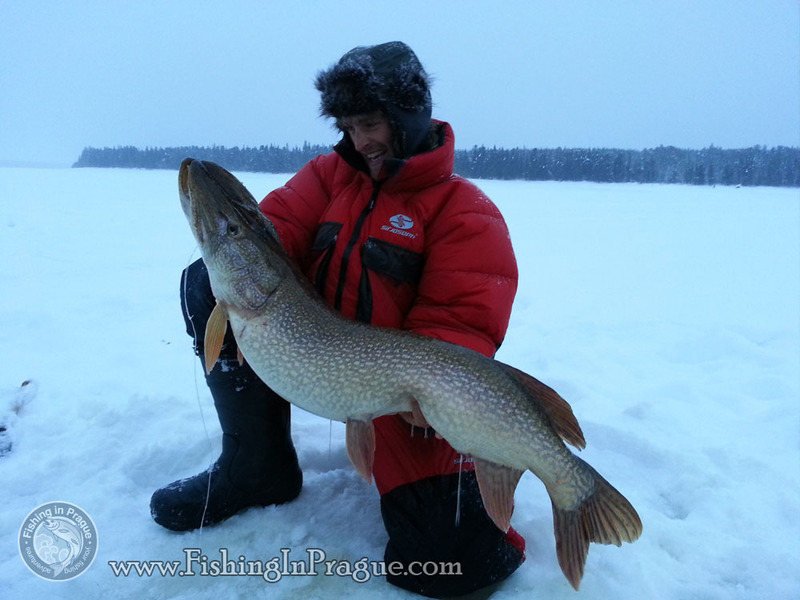 Kneeling on the ice, Jakub pulled out pike, which looked rather like a small crocodile than fish. After precise measuring we realised unbelievable 110 cm and weight 16 kg! The journey is just on the beginning….